Jesus has been on Twitter since December 2009 and his earthly father Joseph of Nazareth joined this holiday season to narrate the entire Nativity story through 140 characters in German and English. Clearly, if you’re associated with heavenly power, you can tweet pretty much what you like. Yet it’s not so simple for mortals in the service of that other, more earthly power: the Canadian federal government. 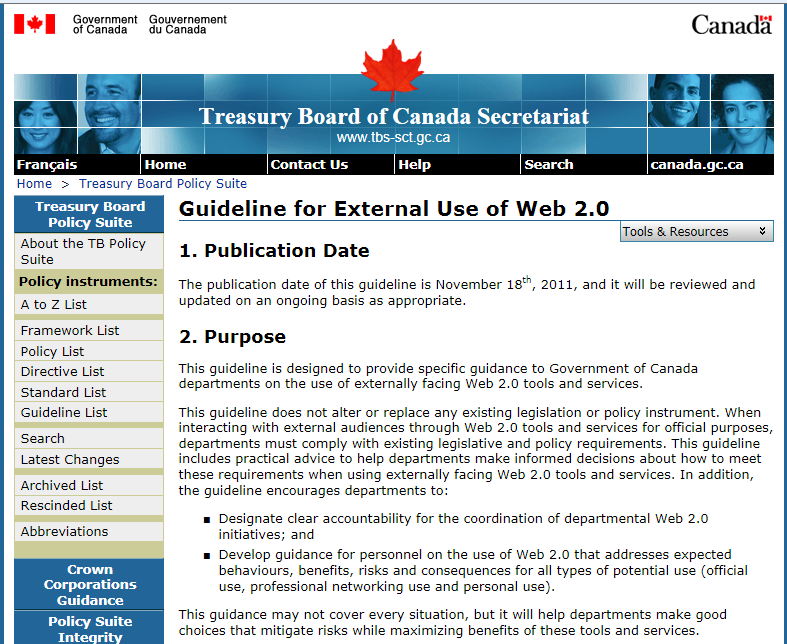 And so it was that Ottawa recently published its first overarching “guideline for external use of Web 2.0“. Before government workers can interact through social networks and collaboration tools, they have a lot of reading to do. The federal guideline is 12,000 words long. That’s roughly four times the size of the Canadian Charter of Rights and Freedoms. If someone were to tweet the document in its entirety, it would take 570 tweets or more. And that’s not including the Policy Framework for Information and Technology and the Communications Policy of the Government of Canada, which, the guideline says, should be read in conjunction. One of the guideline’s key points is that “governance of Web 2.0 initiatives should be clear, succinct and well communicated.” Apparently, the guideline doesn’t have to adhere to its own principles. The document makes readers yearn for the early, simpler days of social media, when organizations like Microsoft informally steered employee bloggers with three simple words: “Don’t be stupid“. Di Maio also thinks the guideline doesn’t go far enough down to the individual level. That’s true, but there’s an even bigger miss. In recent years we’ve seen growing political will to empower government through social media, and this is entirely absent from the document. South of the border, President Obama has been reaching out directly to Americans through Twitter, Facebook and YouTube for years. His online presence has become so strong that some reporters in the White House press corps have voiced concerns that they are being turned into a sideshow. In 2009 Obama also directed his government departments and agencies to establish “a system of transparency, public participation, and collaboration,” which has resulted in a multitude of initiatives, many of the integrating social media. 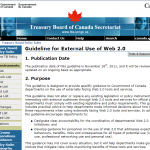 In Canada, federal Treasury Board minister Tony Clement just ordered the overhaul of government websites to include some social media functionality (the guideline page could have been a good starting point). In general, however, Canadian political leaders have yet to catch up with a powerful, overarching approach comparable to the United States. Lengthy as it is, the new Web 2.0 guideline is as an encouraging sign that slowly but surely, social media will creep into the Canadian public sector. They may not have the leeway of Jesus or Joseph, but until change is driven in full force from the top, here’s hoping that some of Ottawa’s public servants accept the guideline as fine print on a ticket that gives access to meaningful engagement with Canadians. Martin Hofmann (@martinhofmann) has worked in the public sector and agency world in Europe and North America. He currently is senior VP, social and digital, at Veritas Communications.